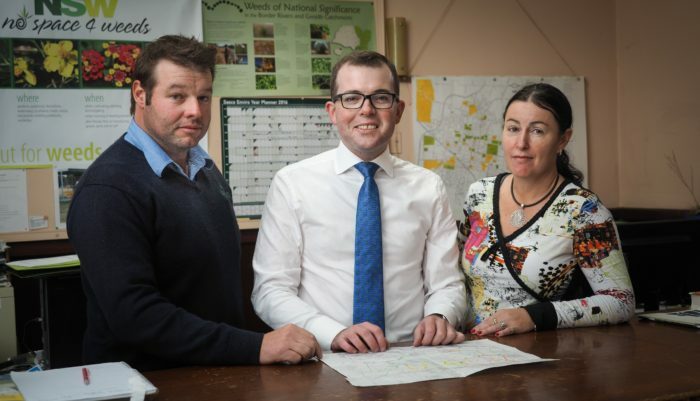 New England Weeds Authority District Weeds Officer Josh Biddle, left, Northern Tablelands MP Adam Marshall and New England Weeds Authority chair Maria Woods discuss the funding announcement in the Authority’s Armidale office. A PROLONGED battle to prevent a vigorous weed entering the World Heritage-listed Oxley Wild Rivers National Park has received a $53,470 funding boost from the NSW Government’s Environmental Trust. The grant, to help local authorities tackle Mexican water lily infestations in the Gara River, was announced today by Member for Northern Tablelands Adam Marshall. The lily has infested the upper reaches of the Gara River, including the Gara Dam. The weed’s thick mat of leaves and rhizomes choke out other plants and prevent access by recreational water users. A campaign led by the New England Weeds Authority will map the weed’s spread along the river and control outbreaks using drones, amphibious Argo vehicles, kayaks and on foot. “This is a rare chance to tackle a weed that is still in a manageable area,” Mr Marshall said. Mr Marshall commended the NSW Environmental Trust, which has generously supported the region in its 2016-17 grant round. “The Trust is doing a great job, in my view, of supporting worthwhile initiatives that can really make a difference to the growing weed burden being dealt with by private and public landholders,” Mr Marshall said.